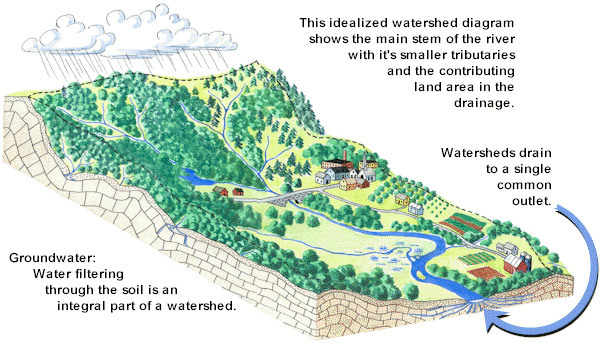 Home > Programs & Services > Watershed Stewardship > What is a Watershed? A watershed is a geographic area of land across which water, and the sediments and dissolved materials it contains, flow on their way to a single common outlet — a stream, lake or river. A watershed can be compared to a huge basin collecting all the precipitation that falls within it and carrying this to the common outlet. 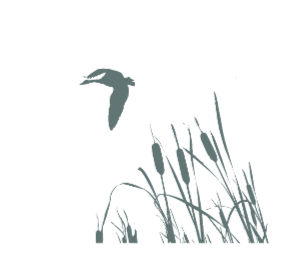 A watershed includes not only the land within its boundaries but also the surface water of lakes, streams and wetlands as well as the groundwater moving beneath the surface. Watersheds vary from the largest river basins to just a few acres in size. Watersheds are natural systems that link the land and water resources and the living organisms, including people, within its boundaries. How we live on the land affects the quality and quantity of water resources within the watershed. Watersheds are natural systems which should link the political communities within its boundaries. Only humans, as a community can come together to protect and conserve the quality and quantity of our watershed resources for the future. Watershed boundaries are not drawn by humans or political processes; they are defined by natural drainage systems with changes in topography (elevation) being the main determining factor in setting the boundaries. The water that travels within a watershed does not recognize property, municipal, county, state or even international boundaries. In Pennsylvania 95% of our land drains into three major watersheds, The Delaware, The Susquehanna and The Ohio, and parts of three others, The Genesee, The Potomac, and Lake Erie. These watersheds are so large they are generally referred to as “basins” rather than watersheds. In Pike County, there are eighteen sub-basins or watersheds which are all part of the overall Delaware River Basin. Each of Pike’s eighteen watersheds are made up of smaller watershed drainages. These watersheds are so large they are generally referred to as “basins” rather than watersheds.